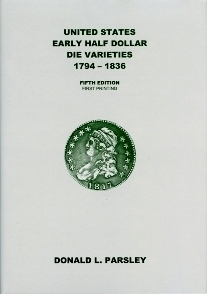 Actual size of book - H 10 1/4" x W 7 1/2"
This extremely essential reference book on United States Early Half Dollar Die Varieties from 1794 to 1936, was originally the work of the late Al Overton, and has been updated by Donald L. Parsley, his son-in-law. The book has diagnostics for identifying each variety by Overton number and is complimented by photographs that are twice the actual size of the coins. This new edition has updated rarity and condition census information and many new photos. This book is the essential guide for the serious collector of Early Half Dollar Die Varieties.